We’re Coming to New York! In just a few days, NETWORK’s Nuns on the Bus will be visiting your area on our journey to the Republican and Democratic National Conventions. In an election year, it’s crucial that our message to Mend the Gaps in income and wealth inequality in our nation be heard and heeded. We hope you’ll join us in New York! Our goal is to bring a politics of inclusion to divided places, change the conversation to mending the vast economic and social divides in our country, and counter political incivility with our message of inclusion. Pope Francis has said, “a healthy politics is sorely needed.” View our schedule and RSVP to join us on this journey. Share your story: What is your experience mending the gaps in your community? Learn more about Mending the Gaps: Read NETWORK’s policy vision. Take the Pledge: Tell your policymakers that you are committed to Mend the Gaps and they should be too. Fuel our work: Make a special gift to NETWORK’s Nuns on the Bus today. P.S. We’re sending these announcements to everyone in a state with a bus event or within two hours of an event — which means you may end up receiving more than one email. We’re sorry for any inconvenience, but wanted you to know about all our stops near you. 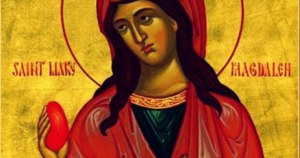 CTA members and friends of the Capital District are invited to Celebrate the feast of Mary Magdalene as we join with the Upper Room Community in Troy this year. 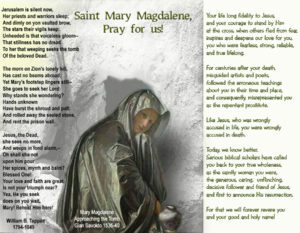 This year the Upper Room Community will prepare the Mary of Magdala celebration. We will begin our celebration at 7:00pm. at the Upper Room in Troy, NY. For this celebration, wear a colorful stole or scarf and we will celebrate Eucharist together. The Upper Room is located next to Brown’s Brewery. (map) Some of you may want to meet before or after for dinner.